Damaged by Hurricane Hugo in 1989, this 1817 house was left open to the weather for 12 years until a sympathetic owner saw the potential through the deterioration. Requiring relocation by the institutional owner, the building structure had deteriorated to the point that intact relocation was no longer an option. As a last resort, the house was thoroughly documented through photographs and measured drawings, then carefully dismantled with each piece of wood numbered and cataloged. 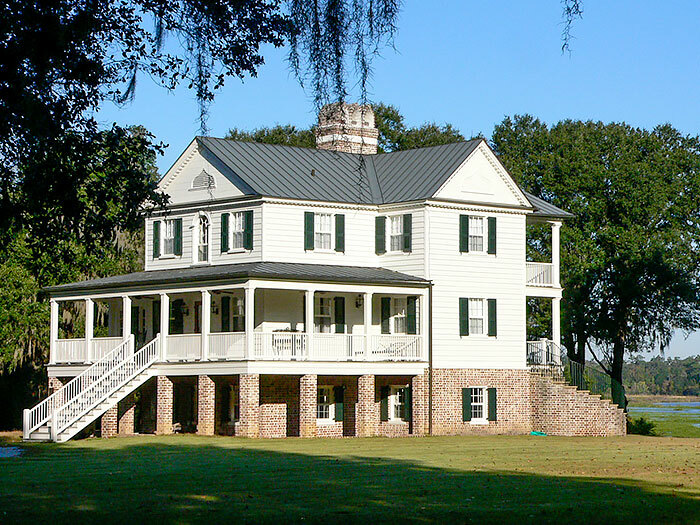 The house was reassembled on a plantation site overlooking an historic rice field where a previous plantation house had once been located. The intricate woodwork was carefully conserved and restored. The highly ornamental plaster was recreated from moulds taken from the originals. Through careful conservation, the reassembled building reused 85% of the original woodwork.